small resort above the villages of Beckenried and Emmetten, Klewenalp has stunning views over Lake Lucerne towards the Rigi and the Mythens. it is very conveniently located for a day trip from Luzern or from the towns and cities of Northern Switzerland. 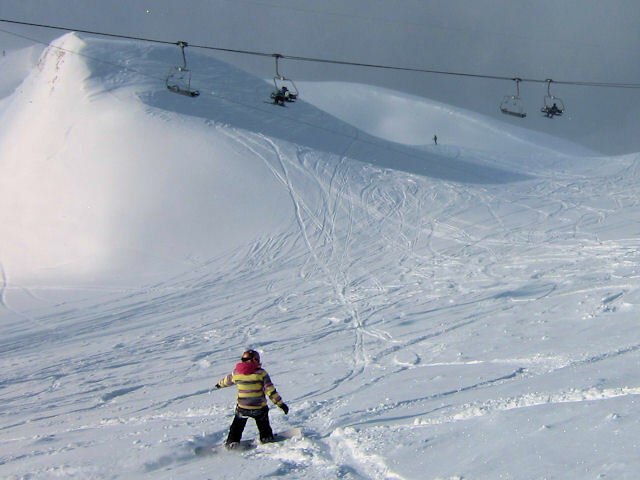 There is a very long series of toboggan runs, airboarding, extensive scenic winter walks, good snowshoe trails and some lovely pistes . Unfortunately the section above Stockhütte and access from Klewenalp to the main runs still relies on surface lifts, there are a few flats (notably going in the direction of Klewenalp from Stockhütte), and there is no provision for snow-making - although the largely North-facing slopes do have a good snow record. If you find yourself ending the day in the charming village of Emmetten, there is usually a shuttle bus back to Beckenried, plus the scheduled post bus runs frequently to Beckenried and on to Stans. 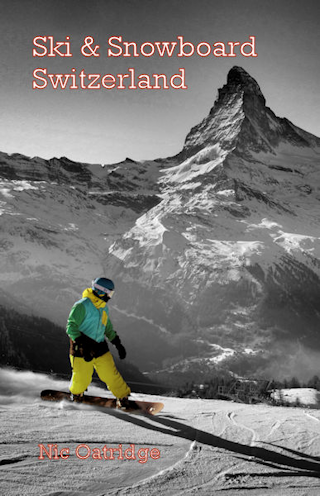 If you do not want to take part in any skiing or snowboarding activities, there are plenty of other activities to do in the mountains. The scenery is spectacular, there are a few mountain restaurants and some excellent winter walks. 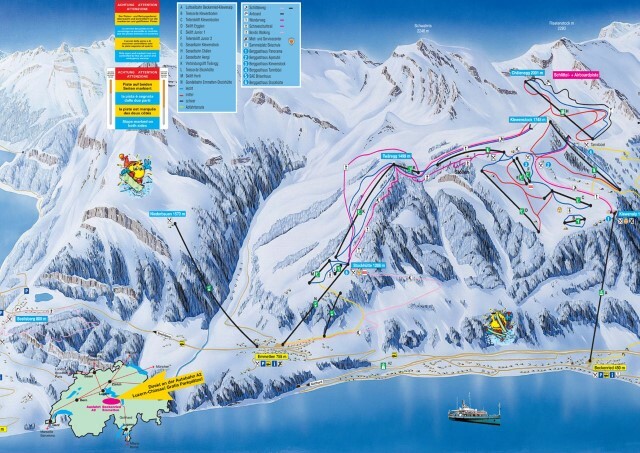 In addition there is the fabulous 9km toboggan run from Klewenalp to Stockhütte-Emmetten and the tough 4km airboard and toboggan run near the Chälen chairlift. There is a good long run starting with blue runs down from Twäregg, continuing after Stockhütte (keep to skiers right) with a trail down to Emmetten. It is also possible to get down to Beckenried along a couple of trails, conditions permitting, after the lovely red run (avoid the blue one) from Chäleneg via Tannebüel - a vertical drop of over 1500m. There is a lot of gentle off-piste if you turn left out of the modern Chälenegg chairlift. The Panorama Schneebar above Klwenalp is the liveliest place on the mountain. For a drink and a cigarette, you can wait for a bus in Emmetten right opposite the stop in the friendly Hotel Engel. 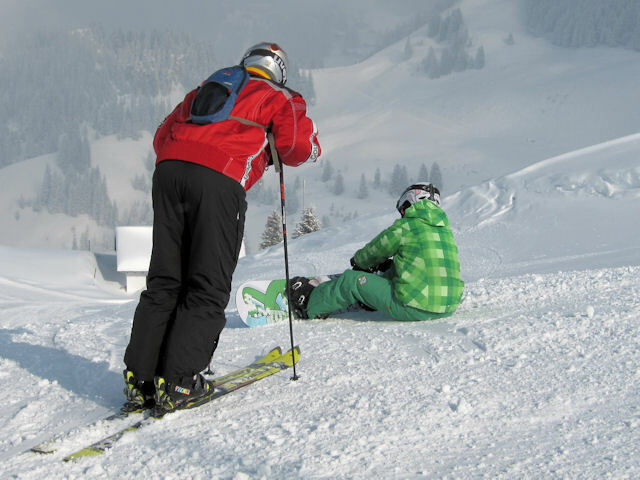 The best destination to access the downhill slopes by public transport in this ski area is Beckenried, Post. The bus stop is 3 minutes from the cable car. Follow the signs. The resort operates the Snow'n'Rail scheme, providing a 20% discount on the combined travel ticket and lift pass. From Zurich the least travel time is 1 hr 53 mins with as few as 2 changes going via Luzern / Stans. Typically, an adult one day combined ticket is 98.80 SFr, reduced to 69.80 SFr with a Half-Price card. From Basel the least travel time is 1 hr 53 mins with as few as 2 changes going via Luzern / Stans. Typically, an adult one day combined ticket is 111.60 SFr, reduced to 76.20 SFr with a Half-Price card. From Berne the least travel time is 1 hr 57 mins with as few as 2 changes going via Luzern / Stans. Typically, an adult one day combined ticket is 122.80 SFr, reduced to 81.80 SFr with a Half-Price card. From Luzern an adult one day combined ticket is 57.60 SFr, or 49.20 SFr with a Half-Price card. Indicative prices are for travel to Beckenried or Emmetten. Click here to find prices for other destinations. Under the combined ticket scheme the additional charge for a two day pass is 35.20 SFr. 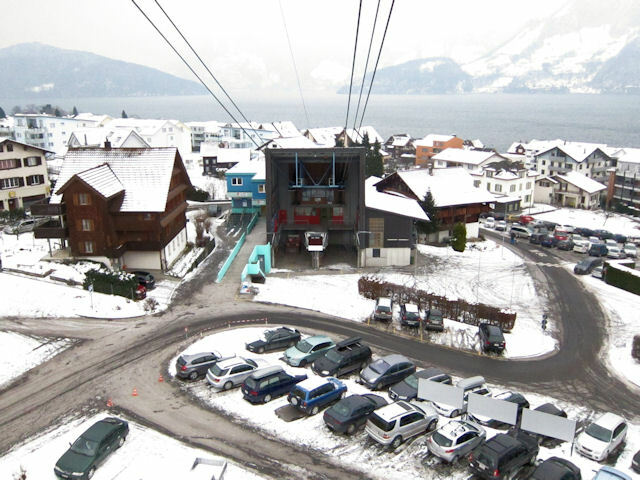 Park at valley station in Beckenried (or Emmetten) to visit car-free Klewenalp. The road distance from Zurich is around 83 km and the journey time is roughly 1 hr 10 mins. The road distance from Basel is around 127 km and the journey time is roughly 1 hr 35 mins. The road distance from Berne is around 144 km and the journey time is roughly 1 hr 50 mins. The road distance from Geneva is around 307 km and the journey time is roughly 3 hrs 30 mins.